Building a house with a chimney may many considerate things, including the types of chimneys. The perfect chimney with a good fireplace will warm the house. To have a perfect chimney, you need to consider the shape and the size. You also need to pay attention to both aesthetic design and functionality. When you install the chimney to your house, the chimney should go higher than its house. Here are the following 15 types of chimneys that you can use for the reference. One of the types of chimneys you can install is the metal chimney. This chimney can be in the double or triple walled shape. To create the aesthetic purposes, this chimney can be attached within the sided frame, wooden structure, or a masonry chimney chase. The construction of the double wall includes the insulation between the walls. Meanwhile, the construction of triple wall includes the air between the layers. The functions are to provide the air insulation and dissipate the heat. Another chimney you can have for your house is a metal with chase chimney. This typical chimney has prefab or masonry look. A chase that covers on the chimney is made of metal. The purpose is to prevent water from getting through your house. You can try to hide the metal by creating the decorative cover or shroud. You can match the shroud with your house decoration. This wood burning stoves chimney is considered ancient. This chimney existed in the 1800s. As its name implies, wood burning stoves chimney can also burn the wood to warm up the cold temperature during the winter. It has a door that has the function like a furnace, which can rise from its base to the roof. If you want to have the modern type chimney design, you can choose outside chimney. This typical chimney is equipped with a modern fireplace. It is usually made from sheet metals. This chimney can be hung off the side of the house. When building the chimney, you can work on the design. The design of the chimney should match the house. Another type of chimney is the engineered chimney. Building this typical chimney requires specific construction from the engineer to place it. The engineer will determine the shape of the chimney, the material, as well as the chimney estimation cost. Find the reliable contractor to build and design your engineered chimney. Try to install the prefab chimney, if you look for another modern type chimney. The prefab or prefabricated chimney has existed since 1980. It is mostly used as the substitute of the masonry chimney. This chimney is usually equipped with a prefab fireplace system. Install and maintain this chimney properly. This typical chimney will have years of use. Another type of chimney is masonry chimney with a flue. This chimney usually has multiple clay lined flues. Each flue has its own functions. The flue connects to a woodstove, a furnace, and a fireplace. You can attach the multi-flue caps mount to the side of the chimney or chimney crown. This chimney consists of a variety of sizes. It is also made stainless steel or copper. 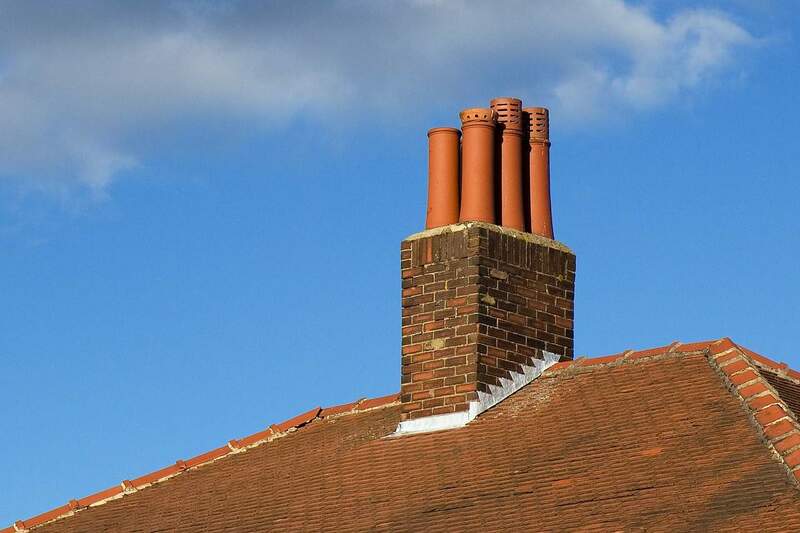 One of the different types of chimneys is masonry chimney with no flue. This chimney has no flue liner. You can use a single flue cap with mounting brackets for this chimney. To create the attractive masonry chimney with no flue, you can add the architectural elements to the shroud. Looking for another unique chimney? Try to install the clay pots chimney. This chimney is capped by three clay flue pots. The clay pots can be used when your old chimney had the short or wide top. They will narrow the opening and keep the smoke from getting into the house. Adding this chimney will create the artistic look of your house. The quoins chimney is made by stone. It has the stone building shape, specifically like the sports quoins. The stones are dressed in marching up the corner of the chimney. When you install the quoins in your house, the quoins will be set to wide and narrow the alternative faces. The brick mortar another great idea to install in your house. You can build the chimney by using mortar. Mortar is considered softer than the brick. You can also use mortar to tuckpoint or fix between the bricks. When mortar crumbles, you can repair it by using simple repointing. The paired chimneys are also known as the double interior chimneys are quite antique and decorative to your house. If you plan to build the Georgian style, the paired chimneys will create the artistic and decorative design. Furthermore, this chimney will keep your house warm and cozy during the winter. This chimney is usually located in the center of the house. The house geometry chimney will create the cool effect. You can have the house with the built-in house geometry. The thick shape of the chimney will fill the geometric features. The width of the chimney needs to be more proportional between the posts on the front porch. Another option you can have for the chimney to your house is flashing options. This typical chimney will move upward from the center of the house. You need to put the straight flashing to both sloping sides of the roof. The function is to separate and keep the water from leaking between brick and roof. You can install a play of angles chimney if you have a roof with some attractive angles. When installing this type of chimney, it should be rotated to a 45-degree angle to the base. This chimney tends to use several rows of corbel decoration as the crown. In conclusion, these 15 types of chimneys have their own unique shapes and sizes. Choose the best chimney which has both aesthetic design and functionality. The most important is this chimney should fit your house design.